Well sort of a continuum. For it to be complete I think a hatchet would need to find its way in there at some point, but I don't have one and the light weight head on the Small Forest Axe is basically that of a hatchet anyway. What's more is, I really wouldn't want any sort of axe for general purposes with less weight or handle. But this isn't a discussion of semantics or even any particular goal of scientific discovery. I was prompted to create this little testing session with just a single thought in mind; for a large knife to do axe duty, it needs to be able to split wood. I'm not looking to help you choose one over the other, or convince anyone that one is better than the other, I just want to see where the dividing lines appear during splitting - where each tool stops and the next one starts. And any excuse to use fun tools is a good one. So to begin with, we need a couple knives that contend for axe duty. I do think a large camp style knife is really only a lighter way to carry something that can split up wood or get into rough work when dealing with bone. Wounding capabilities aside, what else is a big knife really for? Sure, one can benefit from more reach when processing large animals, but the breaking knife or cimeter don't have the spine to edge width we're dealing with here, or the blade thickness, and are much better suited to the task. Old timers made kitchen knives work because that's what they had access to. More likely than not, those knives processed more large game than wood, and so we've discovered the line between large meat knife and camp knife. Thick, wide knives, for me, start to shine when they get bigger than the Kershaw Camp 10. Anything smaller, with similar blade thickness is really too small for big tasks and too big for small tasks. Virtually any 3-6 inch belt knife is more versatile for me than any knife 7-10 inches made with thick steel. 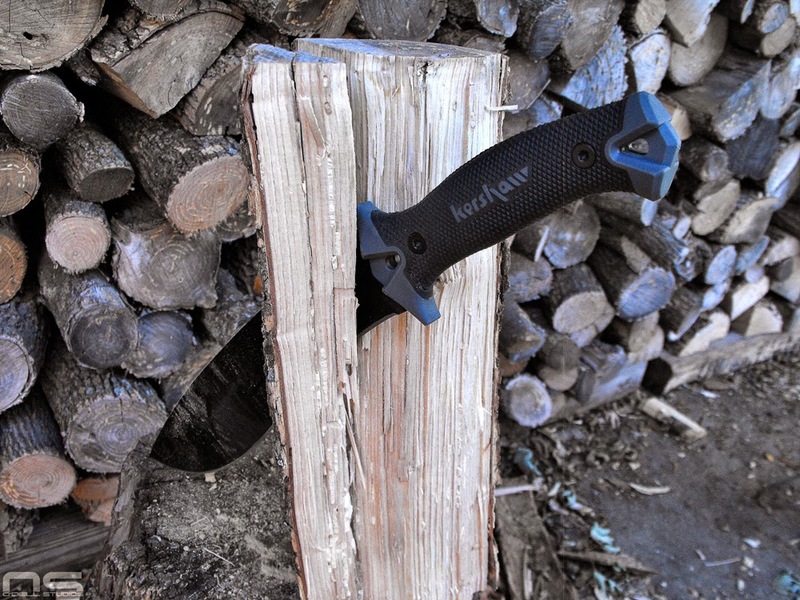 So briefly speaking, here is where we go from general purpose knife, into axe duty contender. Typical results of one-handed power swings. Next, this is a splitting test. I guess it's fair to say that I am looking for a measure of how much energy am I going to use to process wood relative to the carry weight of the tool. Secondarily, what are the limitations of each tool. We all love the romance of felling trees with an axe. Every time I read or watch a review it never fails to include the fabled "chop test" of even the most puny "survival" blades. 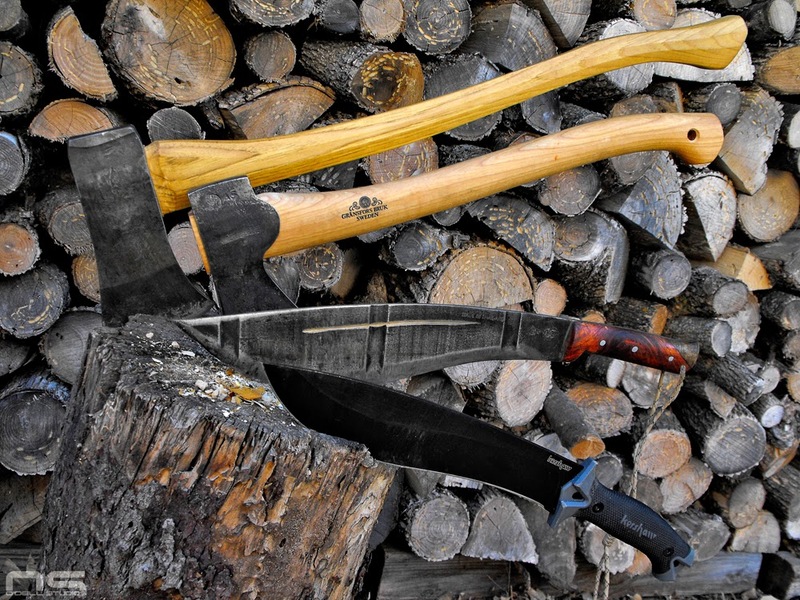 Often, reviewers chop dead standing trees - poorly - to test the chopping capabilities of knives, tomahawks and axes, typically with hard to watch results. The urge is understandable. It's an axe, I want to chop something down with it. In an effort to preserve the dwindling forests of this planet, most of us resist the urge to chop down half the living trees in sight, to relish in the thump of the axe and the shower of wood chips. For the typical outdoor enthusiast who doesn't own hundreds of acres of personal woodland to manage as he or she sees fit, we are left with building camp fires or splitting wood for home use. 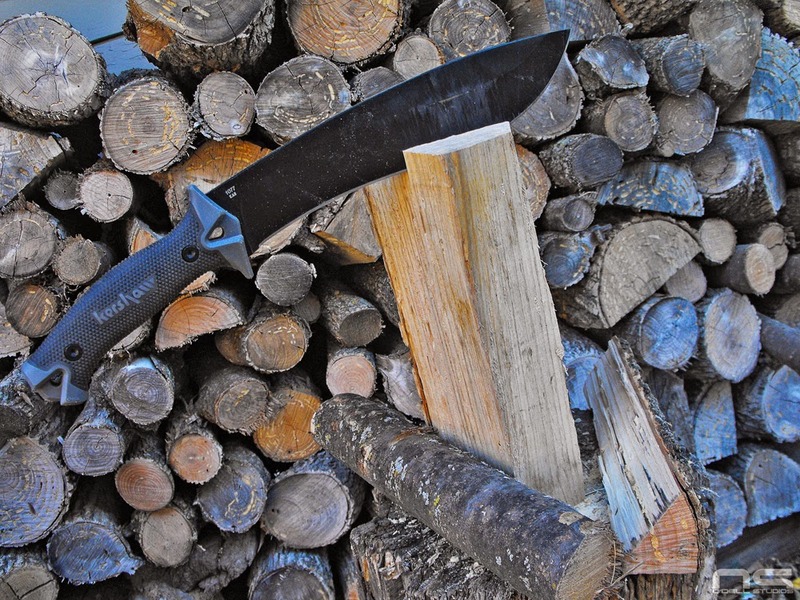 Felling even smallish dead standing trees with even the most appropriate tool is going to be tiring and in the case of the Kershaw Camp 10 or smaller knives, pointless. 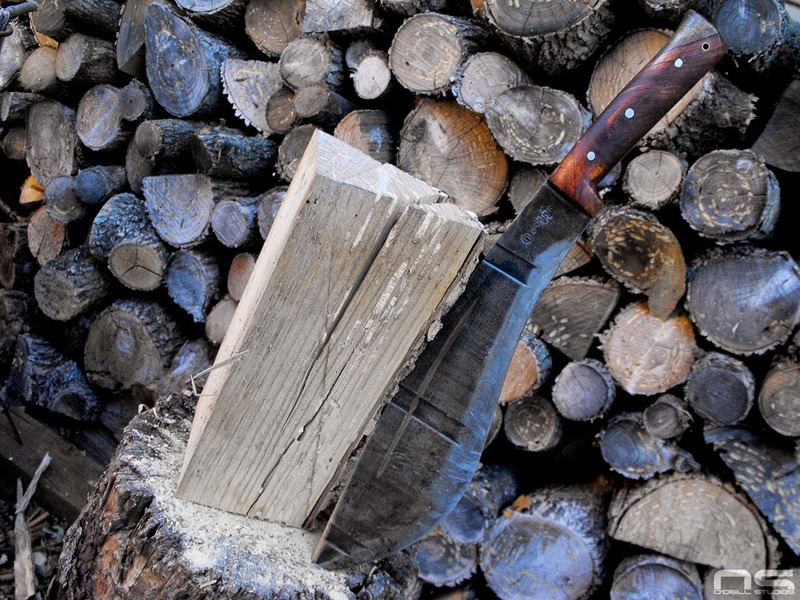 It's probably just as easy to collect firewood without a cutting tool of any kind - laying around, leaning in other trees where it fell, or still standing but small or weak enough to push over - and let the fire do the rest. Bottom line is, I'm not dealing with chopping. Folding saws have obvious advantages when it comes to making long sticks of timber, short sticks of timber. We're looking at splitting. In order to really put these tools to the test, we need some real wood. The woods I spend time in don't seem to carry any of this soft, straight youtube timber that splits into nice wedges like a pizza. I typically get gnarly, twisted hardwoods that split like concrete and in fact, my Father mostly "splits" wood with his chainsaw. I heat my house with a wood burning furnace and to truly heat a house requires efficiency. Hot fires are efficient fires and that means lots of splitting for fuel. Enough of that, you get the point of this test, so let's get started. 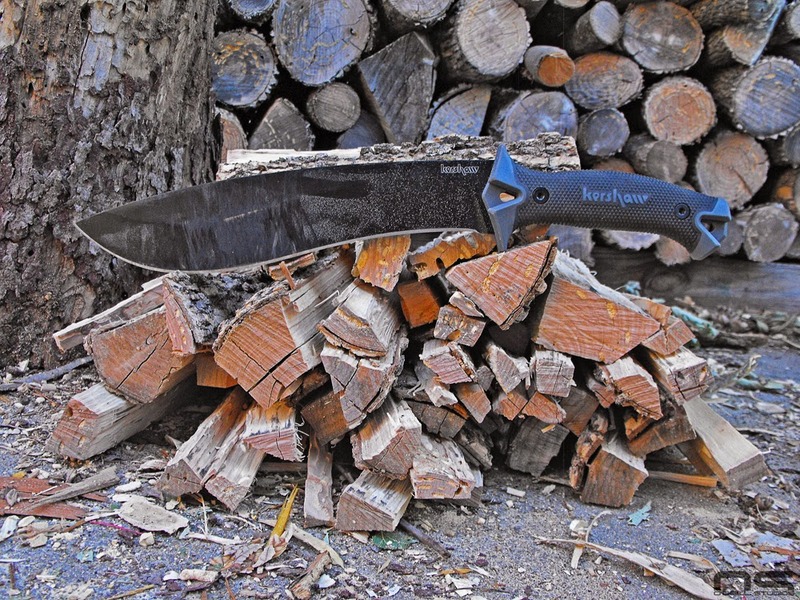 The Kershaw Camp 10 is a popular and fairly handy large knife made of pretty nice carbon steel with a recurve blade shape typical of many American outdoor knives today, and derived from those of far eastern jungles. 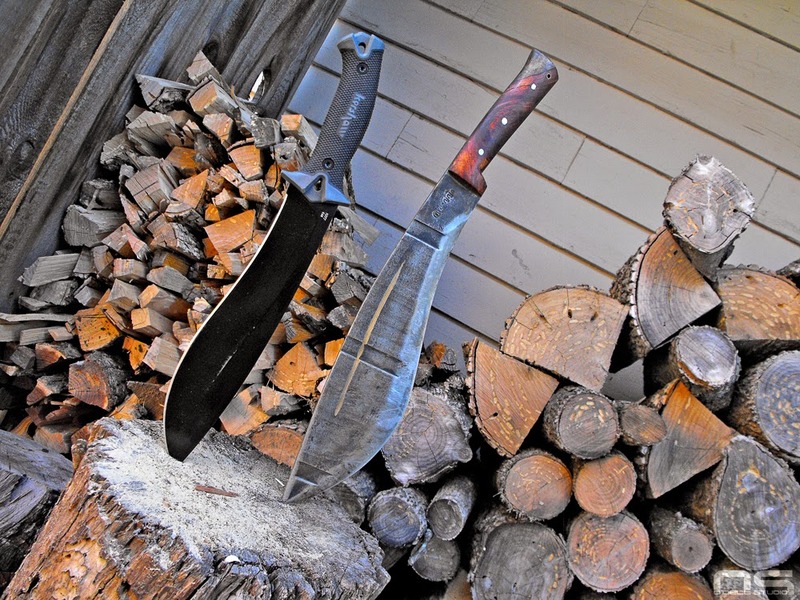 Simpler to forge from available recycled steel and with fewer tools than an American poll axe, large knives in those portions of the world are essentially hand axes with the slicing power of a machete for the sort of dense vegetation found in jungles. 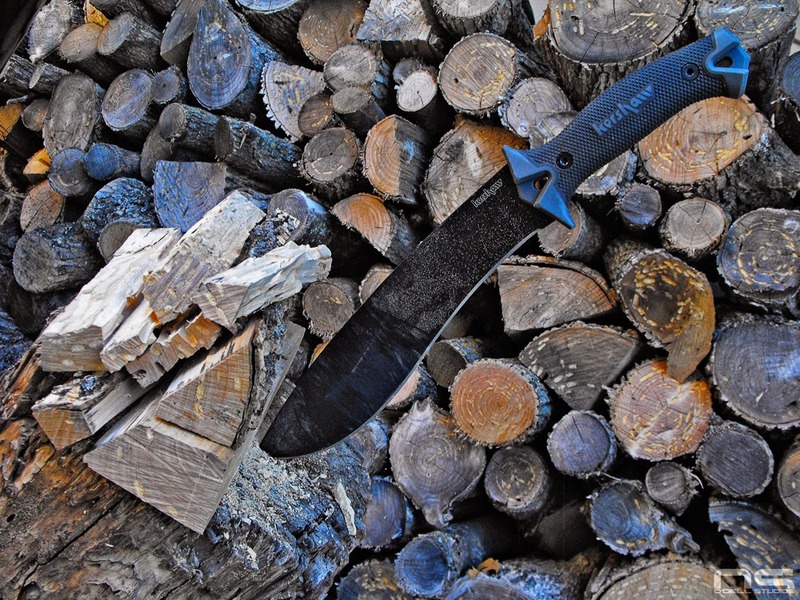 The Camp 10 has a 10 inch blade that runs about .2 inches - a big 3/16ths - and weighs in at 1lb 2oz. It is the lightest of our line-up and the shortest. It is also the most Chinese, and inexpensive. The immediate downside of being foreign produced is not the foreign production itself, but likely the mechanized heat treating process. I'm not saying this from a scientific standpoint, and I know the blade is tough, but chances are it's not as tough as the differentially hardened E-Nep pictured, and you can feel it. However, the high flat grind of the Camp 10, and extra thickness do function as a splitting wedge which sends plenty of the shock of batoning, into the wood, not your body parts. There is a noticeable popping effect while using a baton as the Camp 10 ultimately splits the wood more than it cuts. The extra thickness produces enough weight to overcome the relatively short and somewhat narrow blade. 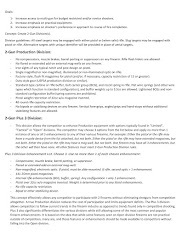 These intelligent design features are what make it handy for its size and set the starting mark for splitting duty sized knives. Limited penetration from a single blow on stubborn wood. 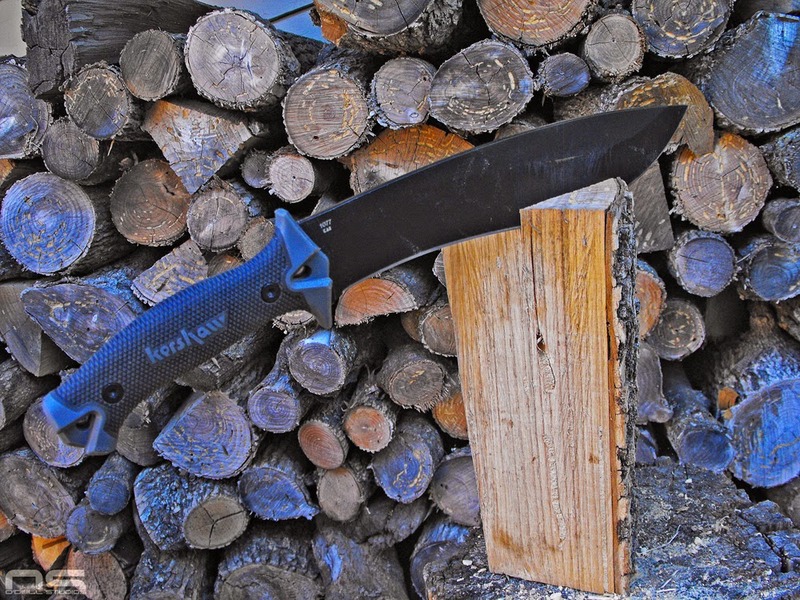 Because the Kershaw Camp 10 is not especially wide from spine to edge, and essentially full tang, not as much weight falls forward as it could. It doesn't have the deep curves of the E-Nep so it feels like less wrist action is accessible with the somewhat short handle. The flares and guards of the handle are nice for the safety Nazis but not entirely useful. It is small and light enough that a power swing feels full of muscle, and short on iron. The tool isn't really carrying itself into the blow and the cut is dependent on the power the user generates, not the inertia of the tool itself. This results in shallow penetration into substantial material. First section split off with baton laying to the right side. With that said, it will split pretty hearty wood using a one handed power swing. I have a good rank of Ash - full of wood bores as you can see - which is often fairly straight, hard, and when dry, is not as stringy as some wood. Often it will pop apart into nice straight sticks and is a pleasure to split, but like any naturally grown wood, it can take a nasty twist, get stubborn, knotted and even stringy. A large portion of my rank is limbs and that's where the tough stuff is found. Taking splits about the size of my forearm from the inside of a round, the Camp 10 was able to split with a single blow, with or against the growth rings. Stubborn pieces required some whacking, but nothing I'd call strenuous. I moved on to large wedges, probably out of a tree 12-15 inches across to get into batoning. At no point did I feel like I was bashing the Camp 10 or pushing it too hard. I didn't even use an especially heavy baton, but I also didn't do a ton of work either. I would call the Camp 10 a success but it would have met its match in stringy and knotted limbs. I took one about 6 inches across, requiring two or three blows from the largest axe pictured to reduce to pieces manageable for the Camp 10. Here is that large wedge reduced to fuel. 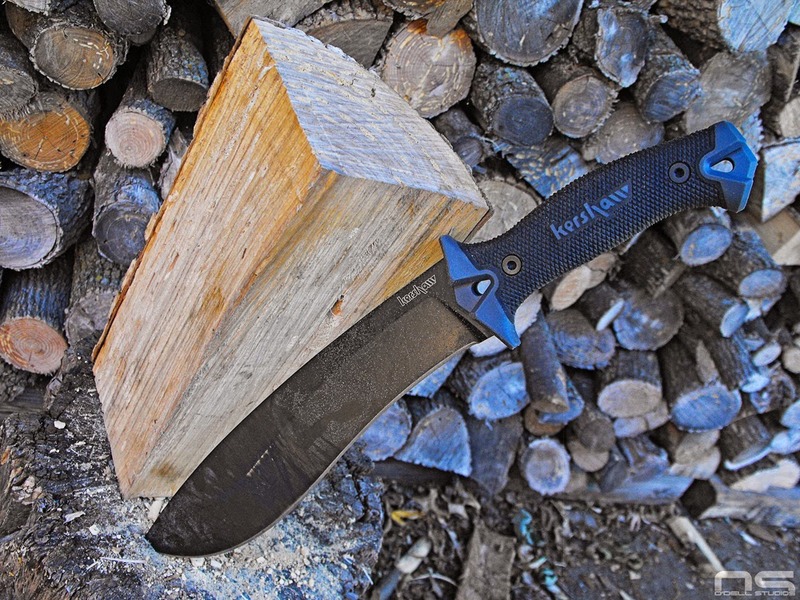 For machete use against small, green brush the Kershaw has the slicing power and speed to be useful, while making pretty easy work of kindling and small fuel wood. Without a solid platform for splitting, I can't say it's particularly good for one handed power swinging. It doesn't have the mass and therefore the accuracy to be really useful or safe when you're putting the kind of effort behind it necessary for splitting bigger timber. However, with some wedging action built into the design it will do quite a bit of work with a baton. 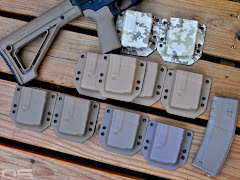 All in all, there are no big surprises from the Camp 10 and doing any more than this with it is probably an indication that you need a tool with more grunt. Just a leisurely 20 minutes worth of work and we're ready for a fire. In part 2 I'll compare the Aranyik E-Nep K-1 to the Camp 10 and the next cutter in line, the Gransfors Bruk Small Forest Axe. In this picture the crack is caused by a single blow from the E-Nep in a wedge almost identical to the one used with the Camp 10 in batoning - nearly blew completely through.